I used to post a similar question and got answers in here : https://community.articulate.com/discussions/articulate-storyline/importing-4-3-size-file-to-16-9-size-file-how-to-make-it-easier-and-work-fine-storyline. Now, much tougher this time, I have a project from other team that has over 200 slides from story size of 4:3 developed in Storyline 3, most of which are video screencast and pic based. And now I have to import it to my existing project with over 100 slides of 16:9 which is in Articulate 360. You just cannot imagine how messy the formatting is with all the pics size/place, texts and fonts... very Terrible! Does it mean I have to manually adjust all pics, fonts, texts slide by slide before/after importing? It is really painful to manually adjust all slides. Please advise if there is a way to save me. I would take a similar approach to what you did before and perhaps adjust the project on it's own prior to importing. Take a look at this documentation and it sounds like 'Fill Background' may be a good option for you. I would then proceed with importing into your current file. 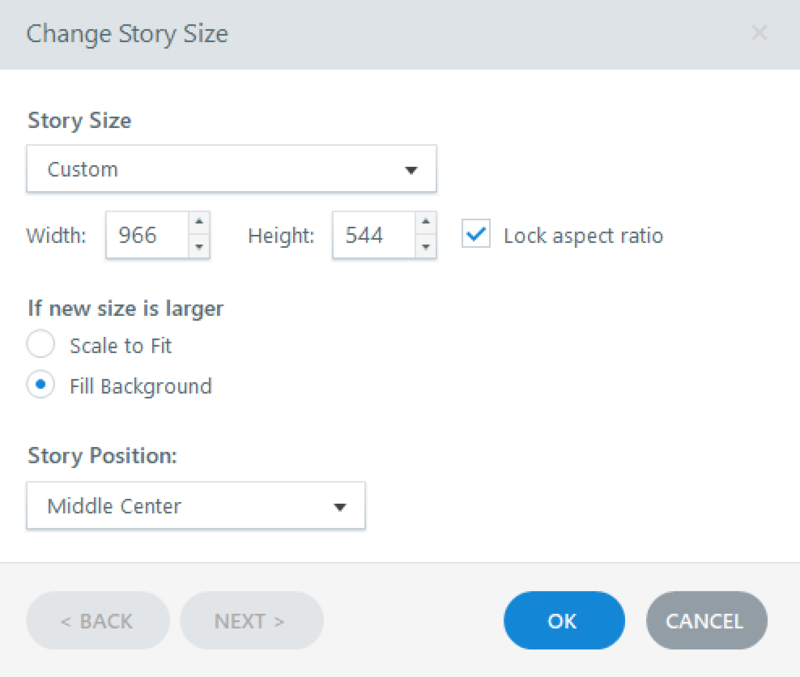 Have you looked at the options here for how you change the slide sizing? Does that help you once you've opened a .story file in the newest version and looking to change the slide size? It may be good to place with those settings and allow you to do less of the manual "repositioning" of items. 1. Changed the size of the 4:3 into 16:9 before merging it to my existing file (16:9). 2. Selected "Scale to fit". BTW, I also tried "Crop", the formatting was worse after "crop". So I stayed with "Scale to fit". After the first two steps, I can see each slide is very messy with 16:9. 3. Imported the new size file into my existing file. So the Mess is going on. Looks like I have to manually reposition pics, fix the fonts and texts. Thanks for the update and letting us know what you've tried. Seems that you covered all of the steps. Were you not able to try the 'Fill Background' option that I shared above? You are increasing your slide size and do not want items to scale, correct? Hmm, I couldn't find the "Fill Background" option. My situation is I only have Articulate 360 but no Storyline 3. Well, the file of 4:3 was developed by other team, they only have Storyline 3. So, when I opened up the 4:3 file that the team passed on to me, seems the file was automatically upgraded to Articulate 360 on my computer (there was a table popped up to ask me to do that). So, when I changed the size of this file to 16:9, I can only find the option (1). Scale to fit; (2). Crop . I did not find any "Fill Background" option. Yes, I tried to make 16:9 size and didn't want to let all items terribly scale. I checked the linked that you shared, seems the link applies to Storyline 3 but my work platform is Articulate 360 (I didn't have Storyline 3)? I am really not sure why I cannot find "Fill Background" options. You're right Phoebe. The 'Fill Background' will be present when the slide size is larger, not smaller. Going from standard 4:3 to 16:9 means the dimensions go from 720x540 to 720x405, which is 'smaller'. I apologize if I caused any confusion. Thank you Leslie for the clarification. I manually adjusted all my existing slides (16:9) to 4:3 to match the other 200+ foreign slides which is a bit easier. I think it is a great lesson for me that before getting two files married or developed, I have to talk to other guys about the story size issue to avoid this trouble. Wow! Thanks for the update Phoebe. How many layers can a slide have?